Hello, hello, hello!!! It's Friday, and that means another Power Poppy post. For this month's, Power and Spark Challenge Julie is challenging us to get buggy with a June Bug challenge. I decided to use the French Lilac Digital stamp set so I could enlarge the image to focus on the sweet ladybug on the lone leaf. I love ladybugs, always have. I think they are such a beautiful red (and other colors, but I'm partial to the red ones), and just sweet with their unique little black dots. I used Photoshop to enlarge the image and diecut it using Labels 28 (Spellbinders). 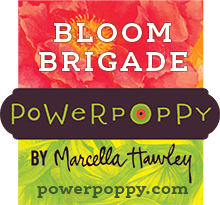 There is so much inspiration going on at Power Poppy right now. You really need to check it out. Click HERE for the Good Vibe 5 post that will surely get those creative juices flowing. And HERE for some color inspiration with the Power Poppy post Hues to Use. I am beyond excited to share that I am currently visiting St. Louis with most of the Bloom Brigade and our dear fearless leader Marcella. I met a few of these lovely ladies 3 years ago for the first time, and now I get to meet a few more. What a blessing: visiting, exploring, laughing, and just plain having a good time! I hope y'all are experiencing many blessings this weekend also. This is so lovely and elegant. This is beautiful! I love your coloring! Pure gorgeousness, Tosh! Beautifully colored and framed. I'm happy every time I see a ladybug in the garden. They are so adorable! Enjoy your time with the Bloomies! This is beautiful. I adore the way you enlarged the ladybug as the focus. Very sweet and such beautiful coloring.